Guest lecturer Professor David Lummus discusses Purgatory XXIV-XXVI. On the terraces of gluttony and lust, the pilgrim’s encounters with masters of the Italian love lyric give rise to the Comedy’s most sustained treatment of poetics. Through Dante’s older contemporary Bonagiunta (Purgatory XXIV), the pilgrim distinguishes the poetic style of his youth from that of the courtly love tradition pursued by his interlocutor. In Purgatory XXVI, Dante reinforces his own poetic genealogy through his encounter with Guido Guinizelli, founder of the Sweet New Style of poetry he crafted in his youth. The interpretative key to the language of paternity and filiation that pervades these cantos is found in Purgatory XXV, where Statius’ embryological exposition of the divine creation of the soul conveys the divinity of poetic inspiration. Professor David Lummus: All right. I’m Professor David Lummus and Professor Mazzotta asked me to come in and substitute for him today, since he’s traveling and can’t be here. So, I guess we’ll get started and I just wanted to — since there was a midterm last time, remind you more or less of what he was talking about wherever he left off. The last lecture, I suppose, was about the relationship between Statius and Virgil. The specifically poetic relationship and the ambiguity that arises in the father/son relationship that’s staged between Statius and Virgil. So Statius recognizes the centrality of Virgil for his own poetic career and his own moral development, by saying, “through you I was a poet and through you I was a Christian,” but at the same time his poetry challenges that of Virgil. Professor Mazzotta concluded stating that, Statius’ poem is about a tragedy — about the tragedy of birth, while Virgil’s is about the history-making quality of the event of birth. That the Thebaid challenged Virgil’s account of the foundation and of history, but he grew as a poet and converted to Christianity by engaging with Virgil’s own ideas of history, specifically with the fourth eclogue. There — there’s a misreading, so the generative quality of Virgil’s poetry didn’t — wasn’t intrinsic in the poetry itself, but was based on Statius’ particular reading of the text. Today, we’re going to be talking about Cantos XXIV and XXVI specifically, but I’ll be saying a few words also about Cantos XXIII and XXV, as a kind of frame to those two canti. In these two cantos — XXIV and XXVI — they continue the meditation and poetic relationships that were going on in XXI and XXII with Statius. Now Professor Mazzotta in his book, Dante, Poet of the Desert, has pointed out that Dante utilizes the figural method of reading history. What about the past pre-figures, the present and the future in a poetic fashion in order to understand the genealogy of poetry — of poets — and in order to place himself in a typological genealogy of poets. In these canti, Dante is engaged in a kind of — in a sustained reflection, Mazzotta says, on literary history and the powers of literature to engender moral conversion, and in probing the inevitable limits of poetic fictions. And there I quoted from his book, Dante, Poet of the Desert. Now it says Canto XXIV, which you read for today, follows directly on Canto XXIII, with a conversation between Forese Donati and the pilgrim. I want to say a few words about XXIII, especially regarding the relationship between poetry and gluttony. Now, although a number of penitents are mentioned at the beginning of this canto, Dante only speaks to two of them. Forese Donati and Bonagiunta da Lucca, and both of them are poets. The first one is specifically a friend of Dante. Now Forese Donati was in Dante’s youth, like I said, a friend and they exchanged a series of vituperative sonnets in which they insulted each other back and forth, and it was filled with language of bodily sensation. I suppose in this canto, the language of the conversation between Forese and the pilgrim sheds a new — the memory of it causes a bitterness in both Forese and in the pilgrim, and the difference between the rhetoric of the two texts marks a new moral vision in the pilgrim. Before in these sonnets, they berated each other’s wives and their vices. In this canto, they recognize each other. They treat each other like brothers. So it’s really a reformation of a poetic community that was in some sense distorted by these — six sonnets, three for each poet. In this canto, the gluttonous are famished and disfigured by hunger and their penitence. Donati’s wife is recalled, and she was treated with obscenity in the sonnets, and she is remembered as a stilnovistic kind of woman whose prayers, ironically, have helped Forese arrive at the terrace so quickly. In a way, it converts that kind of gluttonous, bodily poetry into a different kind of moralizing poetry, I suppose; it corrects it. Now I guess the connection — another connection with gluttony is that Forese along with a number of other Italian poets such as Cecco Angiolieri, he was probably the most famous, was a burlesque poet, and this was also known as goliardic poetry, so from gula, Latin for throat, or for gluttony. This oblique connection allows Dante to speak about poetry in this canto of gluttony. The real connection is that it’s a worldly type of poetry that doesn’t look beyond itself, beyond the concerns of the flesh, I suppose. I would like to point out at the end of this canto, Dante remembers their ribald literary exchange with bitterness, at lines 115 at the very end, he connects the period of his friendship with Donati with a dilemma back in the dark forest in Canto I. “If thou bring back to mind what thou wast with me and I with thee, the present memory will be grievous still.” So he’s pointing out that he has a different perspective on that time of his life. The mode — or I guess the change that Dante experiences are both Virgil and Beatrice, so he is pointing towards what makes him different from what he was a few days ago. Actually, the exchange with Forese was probably not that long before the composition of the Divine Comedy, or at least, not that long before the fictional date of the Divine Comedy. This, in reality, is a prelude to how he dramatizes the differences between his poetry and that of his father’s and brother’s, the ones that he meets in XXIV and XXVI. That’s just as a preface, I suppose, to what happens in XXIV where Dante really just juxtaposes his own style of poetry with that of his predecessors, specifically embodied by Bonagiunta da Lucca. It’s interesting that Bonagiunta who notices that Dante is different because Bonagiunta da Lucca wrote a poem to Guido Guinizelli, who we will meet in XXVI, criticizing how he had brought the terminology of the university, the terminology of epistemology, and of metaphysics, and of theology into the lyric of love. It’s — that’s probably one of the reasons why Bonagiunta da Lucca comes out here. Not necessarily that he was important for some specific reason to Dante, but probably because of that — the fact that he came out and noticed this in public of Guinizelli — this change. I’d like to have a look at — in the text when Bonagiunta da Lucca comes out and addresses Dante. He says at verses 49 through 51: “But tell me if I see here him that brought forth the new rhymes, beginning with “Ladies that have intelligence of love.” It’s Bonagiunta da Lucca who recognizes Dante and specifically by the first line, the incipit, to the poem that basically makes the center of the Vita nuova, the turning point in the Vita nuova, as you all remember, because in this poem, it marks the transition from a self-centered poetry of love where the poet praises himself obliquely by service to the woman, to the lady whom he loves, and his transition to a poetry of praise that is mingled with metaphysical claims for the lady’s value. It’s Dante’s transition from a courtly lyric to a more philosophical lyric. Now Dante responds to Bonagiunta with a really beautiful phrase, and he says: “And I said to him: ‘I am one who, when love breathes in me, take note, and in that manner which he dictates within, go on to set it forth.” Dante is claiming his novelty and at the same time he is saying — he’s linking his own writing of poetry to the activity of a scribe. He says, “I take note” when someone — when love dictates. So he’s explaining his inspiration. In Italian, the word for ‘breath in’ is spira, and he dictates within Dante. Now this inspiration, I think, it needs to be understood in a theological — needs to be understood theologically. We’ll go — I’m going to go onto talk about Canto XXV which explains this retrospectively in a moment. Let me say for now that it — that the words noto, ‘take note’ in Italian, and detta, ‘dictate’ in Italian, point towards the inspiration as this breathing in, as the Holy Spirit, as a movement of love within the Trinity, and that Dante is explaining how poetic inspiration is really a parallel to the unity of the Trinity. This inspiration comes from within, but it’s like someone who dictates from without. In the Monarchia, Dante’s political treatise on empire, he describes God as the only dictator, the only person who dictates. We have to understand this description of poetic inspiration as one coming from an internal instantiation of the divine. So there is a connection between this inspiration and the divine. Bonagiunta thinks — he has this perspective that Purgatory gives him on his past life and he understands that knot — the nodo is also used to describe the sin of gluttony at the beginning of Canto XXIII. Here again, we have this lack of moral understanding. It’s like a moral perspective in life being paid for in the after life, in Purgatory. The poetry that Bonagiunta represents was one that concentrated on worldly beauties and qualities, like I said before. It feigned a service to the lady only to concentrate on the self of the poet and it never really went beyond itself. It was a self-reflexive kind of poetry. In that sense, it could be assimilated with gluttony, in that it absorbed and imitated what came from without offering forth anything, without being generous such as the poetry of Virgil was. And it’s interesting enough Bonagiunta says, “Him that brought forth the new rhyme,” so he brought the new rhymes forth, he offered them out. Bonagiunta is able to see the difference between the two styles of poetry at this point, but I think he doesn’t recognize the kind of uniqueness that Dante is claiming for himself here, because he says, “That your pens follow close behind the dictator.” So he’s pluralizing what Dante says only about himself. He says in Italian, I’ mi son un che and people have pointed out that this — ‘I am one who,’ is both humble and it’s like, ‘I am one who among others who do this,’ but it’s also — it’s also pointing out his uniqueness. Others have pointed out that it echoes, line 314 of Exodus, Ego sum qui sum, this is what God says to Moses, “I am who am,” that this self-reflexive, mi son un che, is an expression of uniqueness, couched in humble language. Dante is really pointing out that he is doing something unique with his poetry, that perhaps Bonagiunta doesn’t really recognize the full extent. He’s — if there is a school of the dolcestilnovo, if there is this Sweet New Style which composes a school — like the Sicilian school that preceded it, which I’m sure Professor Mazzotta talked about in relation to the Vita nuova — then Dante is creating something new within that school. That’s, I think, what’s going on here in those lines. I suppose what Dante is doing in this canto, is marking an extreme contrast between his own poetry and that of the people who came before him. There is a line that divides these two schools, the Guittone, who is a Tuscan poet who imitated Sicilian poetry, the Sicilians who imitated a Provençal poetry, he’s detaching himself from them because of their lack of a moral purpose, I suppose, in their poetry, which Bonagiunta recognizes retrospectively. I just wanted to point out the contrast here; the image of birds probably reminds us of the image of birds in Canto V of the Inferno. They were just — the sinners were described as cranes who were being buffeted about by a tempest. They kept returning to the same spot in a circle, like an eternal return. Here, the same kinds of birds, these love poets, are coming together in a troop and moving along together, and not only are they moving along together, they’re moving forward. So there’s a progress that’s — that opposes the circularity of the storm of birds in Inferno V, and this will come up again also in Canto XXVI. Now I know we didn’t read it for today, Canto XXV of Purgatory, but I think it sheds some light. I’m going to say a few words about it, because I think it sheds some light on what Dante is talking about in relation to inspiration. We talked about that earlier. Now what happens here is Dante asks — Dante is perplexed about how the sinners can be punished with their bodies if they don’t have bodies, so he asks this of Statius. The whole canto basically — he asks this of Virgil I guess and Virgil says, it’s better if Statius explains it to you. The pretext of it all is, how can this happen? What is the physics of it? What is the biology of the soul basically in the afterlife? What Statius does in explaining this, explains how God engenders the soul, how he creates the soul. In placing the discourse of the generation of the soul and the body between two cantos that are basically all about poetic inspiration, Dante I think is drawing a parallel between divine inspiration, divine creation, and poetic generation, and poetic creation. Professor David Lummus: Okay, he usually has a parallel — he’s making a parallel between poetic generation, inspiration from — and poetic inspiration and the divine creation of the soul, the inspiration of the divine in the creation of the soul. I’m going to go on and explain what I mean. I’m just trying to — does that make sense? Professor David Lummus: Okay, all right. I’ll slow down a second. Basically he’s staging here the relationship between predecessors and new poets, so himself and his past basically. He’s explaining how he is born out of the past but is not imitative, and is not — can’t be merely reducible to that past. I can read a little bit of this. What I think is going on here is that ostensibly — basically, Statius describes the creation of the body — the biological creation of the body, which comes from the mingling of bloods, right? Then after that, how the animal that is created, basically, is given a soul by God but becomes a rational — becomes a human being and the human being — the human here is described — he translates it as a ‘child’ but the word that’s actually used is a fante. Now fante would be basically — it’s derived from the Greek word for speech, so a fante would be — one who speaks, so how an animal becomes one who speaks. So humanity is defined in a sense by the fact that we can speak and reason basically. So what happens here, I suppose, is that even though the father is the — generates the body, the soul is directly created by God. So that there’s two kinds of individualities I suppose. You have the body and the soul, and the soul is a uniqueness that is directly created and inspired by God. If you consider this poetically, even though Dante may have been influenced or in a sense created, by the poets that came before him, nonetheless he has his own kind of direct inspiration that separates him from the poets that came before him, at least that’s how I understand it. I think it’s connected that Dante points out the connection, especially by the word spira, he uses the word spira or inspiration twice. They imitate each other, they parallel each other. The connection between fante, the child who speaks is a direct connection to language, the language of poetry. That’s, I think, it explains retrospectively what Dante is claiming in Canto XXIV about his poetic inspiration, this difference between his own poetry and that of his predecessors. Now Canto XXVI, he passes into the terrace of the lustful. Here he meets his own staged poetic father, Guido Guinizelli. He recognizes his father and his debt to his father, and at the same time, he’s recognized as a brother by his father. So his individuality as a poet is recognized — the recognition is staged here. The paternal relationship becomes a fraternal one. What I’m trying to point out with this — the biological embryology is that he can be seen as derivative and different at the same time. So he’s the same and he’s distinguishable at the same time. This canto is in sharp contrast to XXIV I think, because Dante wanted to distance himself from those poets in XXIV and here he wants to show a similarity. He’s trying to assimilate himself with a certain kind of poetry that was — for which metaphysics, epistemology and theology were all central. So it’s a philosophical kind of love poetry. I think he also redeems this love tradition, which in a certain sense, was condemned in Inferno V with Francesca. So this courtly love tradition that was — that caused in a way I — or at least Francesca claimed caused her downfall in saying that ‘the Galehault was the book’ in Inferno V. Here he redeems it and he purges it and cleanses it. You can start off by reading the tercet that begins at line 94, whenever Guido Guinizelli identifies himself to the pilgrim, it says: “Such as in the grief of Lycurgus, the two sons became on seeing their mother again, I became, but with more restraint, when I heard speak his own name, the father of me and of others my betters, whoever have used the sweet and graceful rhymes of love, and without hearing or speech, I went on a long way and thought gazing at him and did not for the fire go near him.” Dante, I guess, he loses his faculty of speech here, because he’s in awe almost like a child before his father. So his behavior imitates his relationship to Guinizelli. I’ll point here as well that one of the main differences, I suppose, between the two poets is symbolized by the casting of the shadow on the fire. His — the reality of his presence there in his body, is what’s really — is what the physical aspect that separates him from the others. It stands in for the aspect of his poetry that separates him from the rest of these poets as well. Since we’re talking about poetic genealogy, it’s interesting that Dante is — he refers to him as a father but then Guinizelli respond by saying: “Oh brother, he there whom I point out to thee, was a better craftsman of the mother tongue, verses of love and tales of romance he has surpassed them all.” In these fifteen, twenty lines Dante is a child before his father and is then equated with his father, by being a brother. So they’re put on the same level and they’re assigned another father, so the grandfather of them all becomes the father, and this father, I guess, who’s not named is Arnaut Daniel. An important poet for Dante in Le Rime Petrose, the ‘Stony Rhymes’ which Professor Mazzotta mentioned, Dante imitated him in those rhymes. He was a poet famous for his difficulty in reading — it was very, very hard to understand an example of the trobar clus. In this same paragraph, these same series of tercets, paragraph in the English, again we have the differentiation of the kind of school, I suppose, that Dante is associating himself with and the other school with which he wants to differentiate himself, because he says that like Arnaut is different from the one from Limoges, so he is different from Guittone — Guittone da Arezzo who is named alongside Bonagiunta da Lucca and Jacopo da Lentini. So he’s separating himself from — he’s aligning himself with the different kind of poetry. He kind of reinforces the kind of genealogy he wants to create for himself. Now this genealogy too, I guess, has its own consequences in the modern age because the words in Italian for the better craftsmen, il miglior fabbro were the words with which T.S. Eliot dedicated The Wasteland to Ezra Pound, as you probably know. This conversation here really becomes an emblem for happy poetic relationships, I suppose, which you can recognize — you’re better at recognizing your forefathers, and at the same time, come out with something that you recognize as new. Some scholars have pointed out — we didn’t — I don’t think you concentrated much on Inferno XXIV and XXV, where Dante utilizes a number of metaphors from Ovid and Lucan and he has this — there’s this topos called the taciat nunc, be silent now Lucan, be silent now Ovid he says, and he basically steals from their lines without recognizing them, saying that he is surpassing them but at the same time as he’s surpassing them, he’s using their own poetry to surpass them. People have pointed out that in these canti of the thieves, that Dante is participating in the sin by stealing from Ovid and Lucan and that this kind of poetic relationship is a negative one, that he’s stealing the identity of the other. Here the father moves out of his way so that Dante can go on and I guess he can progress; he doesn’t get in his way. If Dante recognizes these people, these poets as his predecessors how does he differentiate himself? How, in this canto, does he differentiate himself from them? Then we can look at it through the lens of Canto XXV where the paternal virtue — the generation of the soul granted the paternal virtue. Its place, while simultaneously claimed a direct creation of the soul by the inspiration of the Holy Spirit. I think Dante’s poetic individuality grows out of the artifice, the style that they concentrate on here, the sweet detti d’amore, the sweet sayings of love that he attributes to Guinizelli, so it grows out of the stylistic artifice that these two poets represent are and Guido to form something new, a new kind of speech, a new kind of poetic speech that’s imbibed with the divine and guided by theological and moral meaning. I think we can see this and how these pair of poets are cleansed and how they’re represented in this canto. For example, Guinizelli, when he first calls out to Dante before we know who he is, before he’s even identified himself, I think it’s around line 17 and following, he says, “Oh thou that goest behind the others not from tardiness but perhaps from reverence, answer me who burn with thirst and with fire.” Now the line in Italian is e in foco ardo. Now this is a direct quotation of Guinizelli’s own poetry in a sonnet which he says, in gran pena e foco ardo, “in great pain and fire I burn.” So in foco ardo is basically repeated verbatim. The love poet who’s burning for his lady metaphorically in his sonnet is now burning literally in the penitent fire that’s purging his sin. I think this punishment shows how the perspective of Purgatory is really modifying — giving us a moral sense to the love poetry that Guinizelli — school of love poetry that Guinizelli belonged to. What these poets couldn’t recognize in their own lifetime Dante is able to because of his poetry, this bringing together that he does, which is actually the newness in the Sweet New Style, I think, which isn’t just metaphysical, but it’s theological. To put it in another way, if Guinizelli, Arnaut Daniel, Guido Cavalcanti, who’s not mentioned here again, if for these poets the lady was a philosophical or intellectual phantasm I suppose, for Dante she is a real woman who enacted a real change in his life and that caused that chain of grace to descend into his own personal story. His poetry, I think, seeks to close the gap between the metaphysical, theological reality of God and the historical contingent reality of history and Dante’s own personal story in that history. Love poetry for Dante takes on an entirely new meaning here, and I think Guinizelli shows that he understands this difference with a perspective that Purgatory gives him. Towards the end of the canto when he asks Dante to say a Pater noster for him, to Christ whenever he enters heaven, so it’s really a conversion I think of love poetry, a purgation of the worldliness of love poetry. Finally, I want to say — we’re going to end a little bit early because I actually have to run to another building to teach right after this — my own class. I want to conclude by saying a few words about Arnaut. It’s very peculiar that Dante — this is the only place I believe in the Divine Comedy where another modern romance language is quoted that’s not Italian basically. I could be mistaken, but I’m pretty sure it’s the only place. Now Arnaut was famous, like I said, for his obscurity, the extreme difficulty of his poetic expression, and here what does Dante do to him? Even though he quotes him in the original, he didn’t really write these lines, these lines are Dante’s, but what he does is he makes this difficult hidden poet come out in the open. There’s a little bit of a — Dante’s playing here with Arnaut’s own language. If he was a difficult poet of love, Dante really makes him come out into the open and say what he is saying, so — here also are typical words from the Provençal tradition such as the value — valor, cortes and cantant: they all take on different kinds of meaning. That before the valor, or value of the love poet was not what it is here; it takes on a completely different meaning in Purgatory. He really stages in Arnaut’s own words the purification, cleansing, and bringing out into openness of what love poetry should really be, where it should really lead you. I guess to conclude I wanted to say that in the next canto, you’ll see Dante submitting himself to the same kind of purgation as these poets. If these poets are cleansed by this wall of — by this fire that refines them, he will end up passing through a wall of flame in order to get to where he can enter into the terrestrial paradise. So that he is in reality cleansing himself of the same kind of issue, I suppose. I guess now I can take a few questions if you have any. Hopefully, it wasn’t too disjointed — the lecture, but I’m happy to answer any questions you might have, or try to. Student: In Canto XXIV, Dante refers to Statius as his being more slowly than he would [inaudible], and I know that there’s a lot of different critical interpretations of that line, I’m wondering how we can interpret it as sort of looking later to Canto XXV and the idea of the proper father/son issues? Statius sort of by slowing his journey towards God to stay with Virgil going against Dante’s idea or does — can we reconcile the two? Professor David Lummus: I think you can reconcile them. I mean whenever Dante — whenever he meets Guinizelli, he’s silent. He doesn’t automatically make himself — he doesn’t move his father out of the way. Statius and Dante both know that Virgil is not going to be able to go the whole way. They know that he’s only going to be able to lead them a certain amount of the trip, of the journey. So I guess — I would interpret it as an act of reverence, just like Dante’s silence, whenever he meets Guinizelli is an act of reverence. He doesn’t push them out of the way and he doesn’t trample them. He’s not in a hurry, I suppose. Does that make any sense at all? I think it’s — the way you could interpret it Statius is — if you want to see him interpret that as him as slowing his way on the way to God basically, then you could interpret it as an act of reverence to the person who allowed him to actually be there and not in Limbo. That’s how I would interpret it, I suppose. That Dante in this — in XXVI, is reverent to his father, so at the same time he is showing how he’s moving beyond him by giving a theological meaning to their questionable worldly love poetry. Does that answer your question? Student: When Dante talks about the inspiration which you’ve identified as the inspiration of the Holy Spirit, is he making love synonymous with the Holy Spirit? And if so, looking back at the Vita nuova, when he personifies love in the masculine I’ve always sort of thought of — in literature, when you read religious poetry and stuff, the Holy Spirit’s often sort of a feminized noun, are those things one and the same to him, love and the Holy Spirit? Professor David Lummus: I think there that he’s thinking of — I think at that point he’s thinking of love — I think Thomas Aquinas mentions love as the procession of love, as the movement of the Holy Spirit within the Trinity between the Father and the Son, so that both really are within — participate in the same spirit. So yes I think in that spot, he is really talking about love as the Holy Spirit, as this kind of — or at least as parallel to it. It’s ambiguous. He says — he doesn’t really say that love is the Holy Spirit does he? He’s purposefully ambiguous I think, because love poetry always has that — the possibility of leading you astray, because it’s an aesthetic practice. It’s dolce; it’s sweet. So I think that the — that yes he is talking about love as the Holy Spirit, as this divine love, but he’s also talking about — so I guess in reality that there is a connection between the contingent and historical world and the metaphysical world of God, but that he leaves it ambiguous because it can always be misinterpreted and the aesthetic can always lead you back down to the terrestrial realm. Does that make sense? Student: Why do you think it’s — or what do you think is the significance of the fact that the biological discussion of inspiration of God breathing the soul into the infant? The fact that it’s handled by Statius and that Dante really highlights that by saying — he has Statius say, if it’s Virgil’s will that he explains but can’t refuse it — what’s the significance that says, I want Statius to handle this at his discretion? Because at other times I think Virgil, even though he’s not permitted to know God or to go to heaven, can still speak about divine workings. So I don’t think it’s out of — I mean for me it’s not out of Virgil’s capacity but I just couldn’t understand why he has Statius explain it. Professor David Lummus: Okay, well I guess if the question really had been about what is the nature of the soul, what is Aristotle saying in the De Anima about — maybe Virgil could have told him about that, but the actual question is what is the nature — how does the soul live in the afterlife? That is an entirely Christian question, that’s based on Christian theology, so I think the fact that Virgil defers to Statius there is showing — is connected with the fact that the question is actually about the afterlife and the afterlife is specifically a Christian context that Statius is permitted to know and not Virgil. Does that make sense? Student: Like I said, it is beyond his realm, beyond Virgil’s capacity. 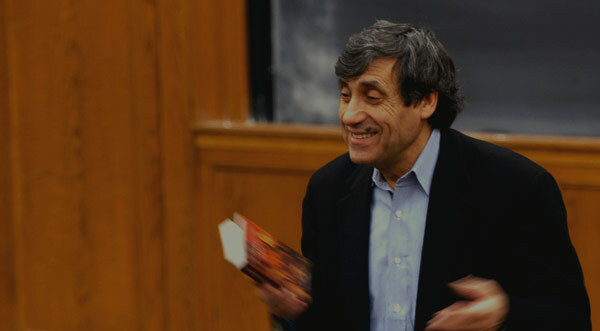 Professor David Lummus: Technically, but the fact that he actually asked Virgil first — I don’t know, maybe he’s saying that it’s actually Aristotle, this idea of the immortality of the soul and the after — it’s actually there and perhaps Virgil could answer it, but then Virgil defers to Statius because it’s a theological question that he’s not privy to. Does that — okay. We’re going to end a little bit early; I hope that’s okay, so I can go change gears here. All right, thank you for your attention and for putting up with me. All right, thank you.